Pig ‘n blankets are easy to make and kids love them. Many adults do too. Use the ready made biscuit dough or make it from scratch. Great either way. Preheat your oven to 415 degrees Fahrenheit. 1 batch biscuit dough or a can of biscuit dough. Make the biscuit dough and divide it so you have a piece for each hot dog. 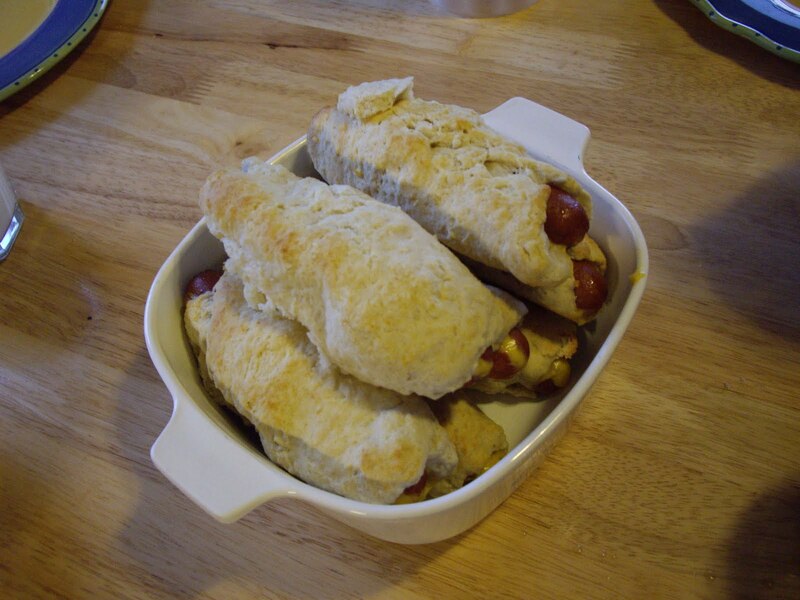 Or, if using canned biscuit dough just separate the pieces- 1 biscuit per hot dog. Make slits in each one of the hot dogs. Don’t go all the way through. You just want a deep pocket to hold the cheese. Slice the cheese into thin pieces. You will want to slice it into 3 or 4 pieces per slice. So if you have 7 or 8 hot dogs you need 2 slices. If 10 or 12 hot dogs you will need 3 slices. Carefully put the cheese into the hot dog slits. Flatten out each piece of biscuit dough. Lay the hot dog cheese side down and close the dough around the hot dog. Work it to smooth it out. You can cover the whole hot dog or leave ends uncovered- your choice. Bake on a baking sheet for 12-15 minutes until the blankets are golden.